President Paul Kagame (right) on a panel at the Milken Middle East and North Africa Summit in Abu Dhabi. 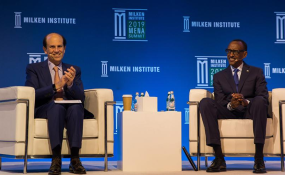 President Kagame took part in a one on one conversation on various topics on Rwanda and Africa with Mike Milken the Chairperson of Milken Institute. The Milken Middle East and North Africa Summit in Abu Dhabi brought together more than 1,000 delegates . Village Urugwiro. One of the ways to do this, he said is sustained investment in citizens, especially the youth. "We need to invest in our people, even countries with natural resources, it will come to waste if they don't invest in their people," Kagame said, adding that "Knowledge or technology are things that are beginning to be evenly distributed across the world." "You find them in different parts of the world doing exactly what is needed in Africa." Kagame said that Africans ought to bring to an end a long standing status quo whereby, despite being endowed with resources, the continent has remained quite poor. "Africa is endowed with so much in terms of natural resources, the numbers are very clear. When you look at Africa's portion of global GDP, it is very misleading when you also know what it is capable of - how do we get out of that history? The challenge in the continent has always been how Africa can be so rich yet so poor at the same time?" the president posed. "We cannot work together without overcoming the challenge that we are so dependent on factors outside the continent. We have to build self-sufficiency and independence. This is what will take Africa where we should be," the Head of State said. "AU activities were being financed at more than 80 per cent from outside yet 55 countries can contribute to make sure we can run our own affairs. Aid should be utilised for you to stand on your feet after a period." he added. "I grew up in a refugee camp where I spent over 20 years like many other Rwandans. We grew up with hardships, and questions and feelings about how to resolve it. If you have struggled, fought wars of liberation, the question you are faced with is what do you do to create a situation you wanted all along that can give everyone a good life," Kagame told the audience. As Rwanda nears the 25th commemoration of the 1994 genocide against Tutsi, Kagame said that reconciliation and forgiveness have been critical in laying a foundation for nation building. "A survivor asked me why is it that in trying to rebuild the country, you have burdened us the victims with the solution to this huge problem. My answer was that between you, the victim, and the perpetrator, there is only one person I can ask and it's you. They have nothing to give. But I can ask you to offer forgiveness, to try to overcome the justified hard feelings so we can move forward and build a country," he said. The inaugural MENA Summit brings together more than 1,000 participants, including a curated group of high-profile senior executives, influential investors, government officials, sovereign wealth fund directors and philanthropists to look into the region's most pressing issues. Other participants at the summit included!Patrice Motsepe the Founder of African Rainbow Minerals, Strive Masiyiwa the Founder and Chairman of Econet Wireless and Sir Richard Branson the Founder of Virgin Group.